[the G ] 【天文】 きりん座. From French giraffe (now girafe), from Arabic زَرَافَة‎ (zarāfa, “giraffe”); ultimately from Persian زُرنَاپَا‎ (zurnāpā), a compound of زُرنَا‎ (zurnā, “flute”) and پَا‎ (pā, “leg”). A ruminant, of the genus Giraffa, of the African savannah with long legs and highly elongated neck, which make it the tallest living animal; yellow fur patterned with dark spots, often in the form of a network; and two or more short, skin-covered horns, so-called; strictly speaking the horn-like projections are ossicones. (Cockney rhyming slang) A laugh. Are you having a giraffe?! 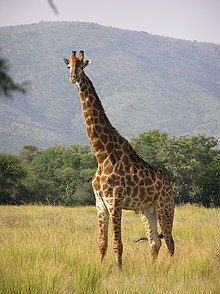 The giraffe (Giraffa camelopardalis) is an African even-toed ungulate mammal, the tallest of all extant land-living animal species, and the largest ruminant. Its scientific name, which is similar to its archaic English name of camelopard, refers to its irregular patches of color on a light background, which bear a token resemblance to a leopard's spots, and its face, which is similar to that of a camel. The average mass for an adult male giraffe is 1,200 kilograms (2,600 lb) while the average mass for an adult female is 830 kilograms (1,800 lb). It is approximately 4.3 metres (14 ft) to 5.2 metres (17 ft) tall, although the tallest male recorded stood almost 6 metres (20 ft).